If we want to improve democracy, we need to start with redefining our core values. But there is also a broader need for redefining human values – existential risks. Among those risks that are most affected by human values is the risk linked to Superintelligence, which may become our most dangerous adversary. Thankfully, that has been already appreciated by those that are directly involved in creating AI, and ultimately the Superintelligence. Principle 2: What set of values should AI be aligned with, and what legal and ethical status should it have? Principle 11: Human Values: AI systems should be designed and operated so as to be compatible with ideals of human dignity, rights, freedoms, and cultural diversity. But what are values? Wikipedia defines value in ethical sense as the degree of importance of some object or action, to determine which actions are best to do or which way is best to live. Values also describe the significance of different actions and what “worth” we assign to them. It deals with right conduct and living a good life, in the sense that a highly valuable action may be regarded as ethically “good”, and that an action of low value, may be regarded as “bad”. Values can also be defined as broad preferences concerning actions or outcomes. As such, values reflect a person’s sense of right and wrong or what “ought” to be. “Equal rights for all”, “Excellence deserves admiration”, and “People should be treated with respect and dignity” are representatives of values. There are several types of values such as ethical, ideological (religious, political), values, and aesthetic values. Values influence people’s attitudes and behaviour (Wikipedia, 2017). Values also describe people’s basic needs, such as freedom, dignity or comfortable life. They can be seen as a hierarchy. 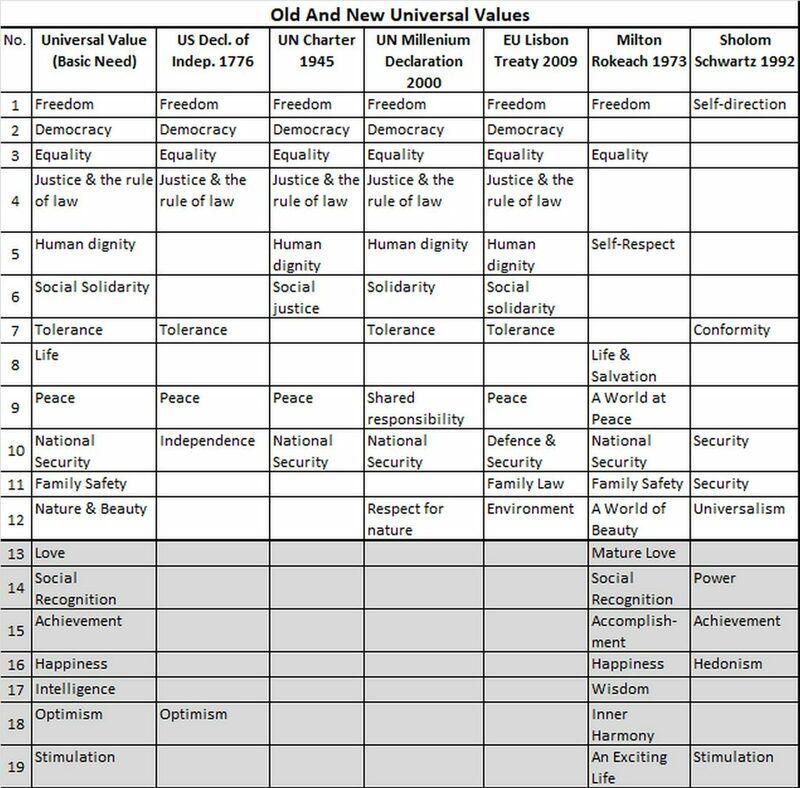 At its bottom are personal values that an individual holds and which are usually a selection of values of one or more cultures. At the next level are cultural values shared by individuals of a given group or a territory. Finally there are universal values shared by most people world-wide. One would assume there is no difference between Universal Human Values and Universal Values of Humanity. But there is such a difference. It deals with two aspects of values – their scope and their change in time. Under ‘scope’ people understand that all values relate to humans. Nature, including all animals, is a collection of passive objects that cannot argue for their values to be respected. But that, in my view, is wrong. We as humans should extend the scope of values, meaning these are Humanity’s values, i.e. these values that we as Humanity adopt on behalf of all humans and all living beings. Restricting universal values to humans only would exclude all animals and more importantly, the new species that may be born as a result of AI developments, culminating in Superintelligence. Just consider that the exponentially changing reality may include new thinking and intelligent beings, including Superintelligence, potentially with its own consciousness. This is where the second element – the change in time of the applicability of a given value comes into account. Leaving the Universal Human Values statement as it is, i.e. static, would perhaps be incorrect. Therefore, on this site Universal Values of Humanity is used rather than Universal Human Values. “The Union is founded on the values of respect for human dignity, freedom, democracy, equality, the rule of law and respect for human rights, including the rights of persons belonging to minorities. These values are common to the Member States in a society in which pluralism, non-discrimination, tolerance, justice, solidarity and equality between women and men prevail.” (Lisbon_Treaty, 2008). However, we know that morality is not static and neither is the meaning and scope of universal values. Both change with time following the progress in human development, better understanding of human conditions, our needs and possibilities. Enabling the world to mitigate existential risks more effectively. So, what could be these extended Universal Values of Humanity? They have been compiled in a table that lists values from three most important documents: USA Constitution, UN Charter and EU Lisbon Treaty. To that list, propositions offered by two important psychologists in the field, Sholom Schwartz and Milton Rokeach, have been added. These values are discussed in detail in Tony Czarnecki’s book: “Who could save Humanity from Superintelligence”.